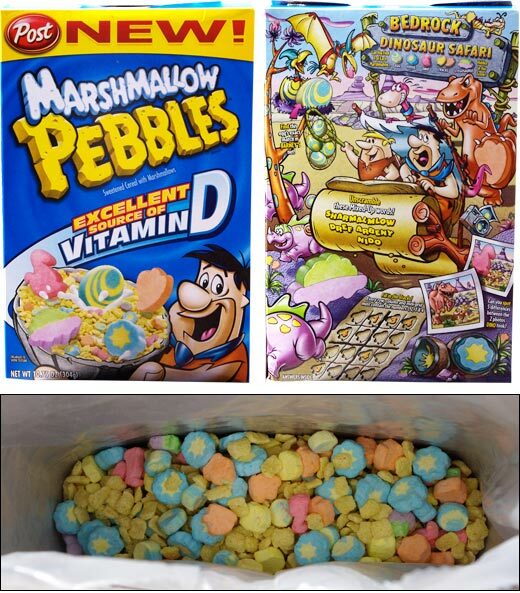 Marshmallow Pebbles is described on the box as a "sweetened cereal with marshmallows." It should really be described as "sweetened marshmallows with cereal." The amount of marshmallows in the cereal is insane. Marshmallow bits are seriously the first item in the ingredients list. It's bonkers! Marshmallow Pebbles consists of yellow-tan traditional Pebbles-shaped pieces and a crazy amount of colorful marshmallow bits in the shapes of dinosaur eggs, fossils, the character Dino, dinosaur tracks and Stegosaurus dinosaurs. The flavor is exactly what the box promises... marshmallow. There's nothing particularly interesting about it. You might sense subtle undertones of vanilla and caramel if you are super adept at eating marshmallows. The big story here is the wacky amount of marshmallows in each serving. After pouring cereal into my bowl, I couldn't believe my eyes. I checked that the marshmallows hadn't all settled to the top of the box somehow. Nope. I was looking at a box of nearly all marshmallows. I give this cereal two points for boldness and then immediately take away two points for the absurdity of serving kids an actual bowl of marshmallows for breakfast. One point is given for the scientific marvel of keeping the the sugar in a bowl of marshmallows to 10 grams. Take away one point for a lack of dietary fiber. Finally, I add two points because I like the Flintstones. That gives this cereal a total of 2 golden eggs. The bottom line: Cocoa Pebbles and Fruity Pebbles are better cereals. If you want to have a bowl of marshmallows for breakfast, this cereal might be a better option than the puffy marshmallows in see-through bags. This cereal should probably be avoided. Nutritional Considerations: Each 3/4 cup serving contains 110 calories, 0.5 grams of total fat (0 saturated and 0 trans), 24 grams total carbohydrates, less than 1 gram dietary fiber, 10 grams of sugars and 2 grams of protein. What do you think of Marshmallow Pebbles? So... I don't want my young kids to have it... but I want some myself! Cereal at its finest! Now where can I find it? It's not in my local store anymore. As it is the only gluten-free marshmallow cereal out there, it racks up points just for that. Once you eat all the marshmallows, though, there is not much to write home about! Um... these are just like a grosser version of the already nasty lucky charms cereal. This cereal has absolutely nothing going for it. The light, airy texture of Fruity/Cocoa Pebbles is absent, and coupled with the marshmallows, it has a sickly sweet artificial "birthday cake" flavor. I won't be sad to see this go. 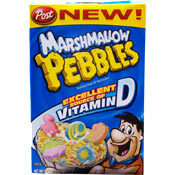 You'd expect a cereal with Marshmallow headlining the box to be sweet and tasty, dare I say marshmallowy. Sadly none of that is to be found in this misbegotten mess. The solid pebble shapes are blander than sheet rock and surprisingly the marshmallow's, though in overabundance as stated in the review, are also incredibly bland. I suppose you sacrifice flavor for lower grams of sugar. Buy at your own risk, I paid 2.50 for a box. I like to make Fruity Pebbles into marshmallow treats instead of using Rice Krispies. So I think I buy some of these and pour some half and half on them. Mmmm. But only as a desert treat. Breakfast for the kids.... no.